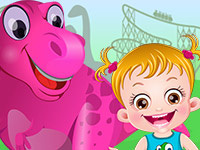 Description: Baby Hazel and her cousins are visiting Dinosaur Park this weekend. Let's join the kids to enjoy a lot of fun-packed Dino games and activities at the park. Help Hazel to learn interesting facts about various species of Dino by complete different activities. Be with Baby Hazel and fulfill all her requirements to keep her safe and happy.